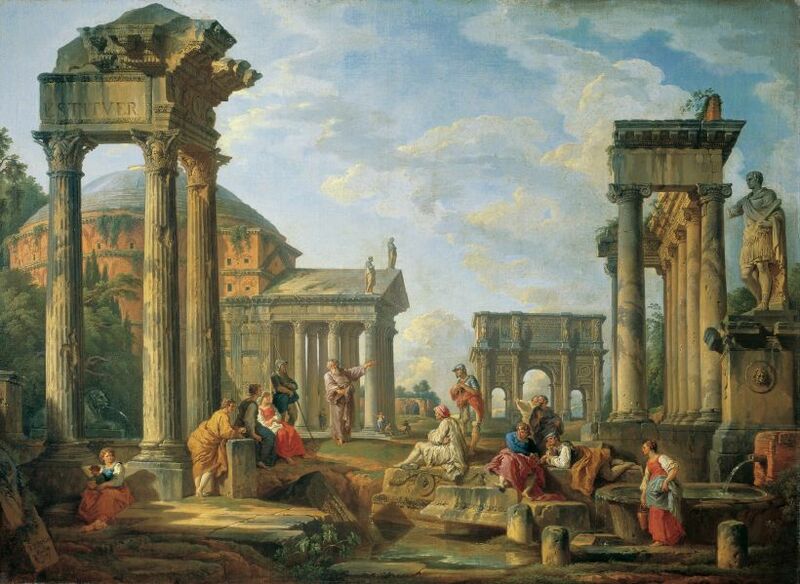 Roman ruins with a prophet, by Giovanni Pannini, 1751. The legal and political discourse over cultural heritage is today dominated by a number of sophisticated conceptions. First, the term cultural heritage is used to focus attention on the manifestations that do not assume tangible form but that represent evidence of the way of life and thought of a particular society. Such a shift of interest witnesses the perception of culture as a human centred, socially constructed legacy belonging to all mankind. Secondly, cultural heritage can be seen as part of the physical public space that we normally call the ‘environment’ or the ‘landscape’. This approach takes into account the interactive link of such heritage with the life of people inhabiting it. Thirdly, cultural heritage may also be seen as a powerful tool to build a sense of nation. It is a fact that, since the 19th century, nations have used representative cultural treasures as means for supporting or legitimising claims to self-determination and independence or for creating a cohesive national identity. Fourthly, cultural heritage today can be seen as the object of individual as well as collective rights. In this sense, cultural heritage becomes an important dimension of human rights. Chechi, Alessandro. Safeguarding the human rights dimension of cultural heritage through restitution [online]. Human Rights Defender, Vol. 24, No. 2, Jul 2015: 11-12. Availability: <http://search.informit.com.au/documentSummary;dn=376874607084084;res=IELHSS>ISSN: 1039-2637.